Standing still is not an option in any area of business, and this is true as well for business education. Throughout the five years of the Sobey School strategic plan, the school has continued to innovate, grow and develop across many elements. New programs have debuted, existing programs have seen significant renewal, a new building houses the Sobey School Business Development Centre (relaunched in 2018 as the Saint Mary's University Entrepreneurship Centre) and the university’s plans for an Entrepreneurship, Innovation and Discovery Hub point to a future further development. Our reputation and brand have evolved from staid and dated to a dynamic, living embodiment of Impact with Purpose. New faculty have infused the scholarship of the school with new directions and approaches. Dr. Wendy R. Carroll is an Assistant Professor in the Management Department at Saint Mary’s University, and the Program Director for the Sobey EMBA. Wendy’s research program focuses on human resource management, workforce strategies, employee and industrial relations, labour force dynamics, and evidence-based management. She has a number of peer-reviewed publications in HRM and employee relations journals, several book chapters, and numerous papers presented at leading management conferences. 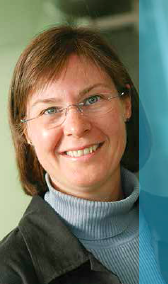 She has also been the Faculty Director of the Workforce Strategies Research Group. Dr. Feng Liu ’s research interests focus on board team and top management team strategizing activities and emotion in organisations. She uses qualitative research methods such as video ethnography and interview to examine how strategies are formed, changed, and implemented in organizations. She is a knowledge philanthropist specialising in leadership development for non-profit boards. An Assistant Professor of Marketing, Dr. Pancer started his career as a marketing analyst with IBM, Magna Automotive, and Rogers Communications. He completed his Ph.D. in Management, concentrating in marketing, at Queen’s School of Business. 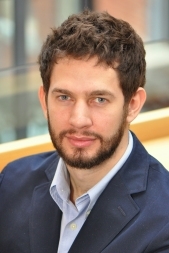 His research interests include consumer judgment formation and decision making, social and interpersonal influences on consumption, consumer identity, branding, and consumer well-being. His research has appeared in the Journal of Business Ethics, Journal of Advertising, Journal of Historical Research in Marketing, as well as national and international conferences. He has also been recognized with national (SSHRC) and provincial (OGS) fellowships for his work. An important step in focussing on building our reputation was finalizing our brand. Revolve Marketing worked with us to distill this Brand DNA. From this platform, we can extend our innovation efforts and work on developing the school in new ways. We regularly review our programs for structure and learning goals. We do this as part of our AACSB commitment and our own desire to seek relevance and continuous improvement. In 2014, the Dean initiated a review of the flagship MBA program. A committed group of faculty, student representatives and staff met regularly, starting at square one with establishing the fundamentals. All aspects of the program were evaluated to see if they were working, were relevant, were meeting the needs of the students, and if our program was aligned with the school’s overall mission. After a thorough process of extensive information gathering, analysis and consultation, the program was redesigned to a significant degree. In 2016, as the MBA celebrated its 40th year of graduating students, the renewed program launched. The Sobey MBA is now cohort-based, to facilitate stronger relationships and support peer retention efforts. It is characterized by immersive experiences, both locally via a service learning component, and internationally in the form of a mandatory intercultural travel experience. The idea of these immersive experiences will soon include an entrepreneurial mindset component and is also reflected in a new set of supports for students engaging in case competitions. The program structural elements were redeployed to give appropriate weight to ethics and responsible leadership, a reflection of the school’s overall commitment to the UN initiative, PRME. There is a robust career services component to ensure students are prepared to manage their careers to meet their personal goals. In late autumn, 2017, the Sobey School announced it would re-examine how it does executive education. “The Sobey School aims to make an impact with purpose and to mobilize our research and knowledge into the business community,” said Sobey School Dean Patricia Bradshaw, who acknowledges the key role that senior business leaders play in this knowledge transference. This year, the executive and professional development department of Saint Mary’s was moved under the Sobey School umbrella, providing the school an opportunity to align its offerings and ensure market needs are being met. “It’s a time when we can line the offerings up with what we know about the current state of the executive development market and think about where the gaps are,” says Dr. Bradshaw. Therefore, coming out of a year of being recognized by Ivy Exec as the 5th ranked EMBA program in Canada, the AACSB-Accredited Sobey EMBA is getting a renovation. Over 2018, the school will focus on crafting a transformed iteration of the successful program, to build a solid foundation for the next 25 years. Student intake has been paused until the process is complete in 2019. 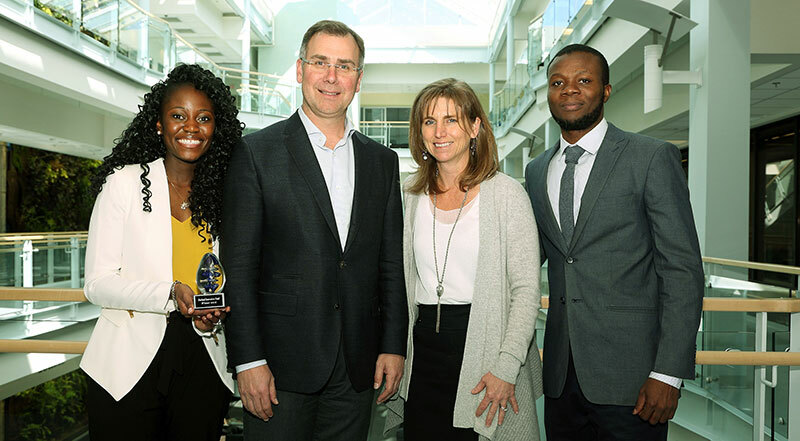 Dr. Michael Durland and Catherine Durland are pictured with Shawn Simamba and Samuel Ayanlaja of SeeMePly, one of the three winning teams at the 2nd annual Durland Innovation Fund competition held April 21st. The other two winning teams were SWAP (Armando Tenias, Rahul Tiwari, Jared Perry, Nigel Lutchman, Kardam Tiwari) and ProTell (Yves Ibeme and Shivani Rawat). In 2013, the Master of Technology Entrepreneurship and Innovation launched as the first degree of its kind in Canada to be embedded in a business school rather than an Engineering faculty. One of the program’s goals was to create “T-shaped professionals”, that is, entrepreneurs who chose to build on their deep technical knowledge with a broad set of business skills to help them build innovative startup businesses. The program offered students the option of building a business, engaging in an internship or writing a thesis. Shelley Simpson, CEO of Prism Lighting Solutions, whose premier product, Showbattery™ has been recognized by the tradeshow industry for its innovative energy savings. Ashored is an ocean tech company that uses technology to protect species at risk, including tangle-free lobster traps to protect whales. The company, a product of the 2017 cohort, has received a lot of recognition including $50k in funding from Spark Innovation, and has merited a spot in COVE. MTEI students Ross Arsenault and Aaron Stephenson created the company with Max Poole, a Sobey BComm grad enrolled in the Master of Science in Applied Health program at Saint Mary’s. 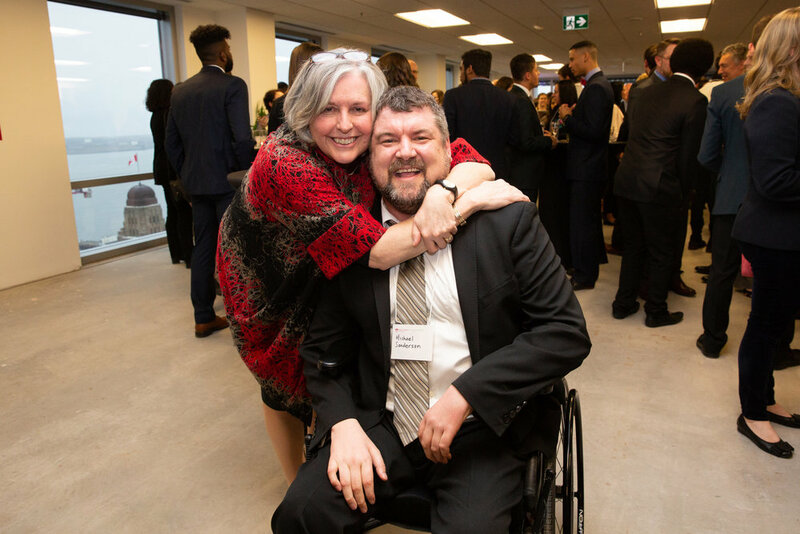 In 2015, the MTEI program received a sizable donation from Scotiabank, as well as a personal contribution from Saint Mary’s alumni Mike and Catherine Durland. As a result, Dr. Dawn Jutla, program founder, was named the Scotiabank Professor of Technology Entrepreneurship and the MTEI program has a generous fund named for the Durlands, which supports student startup development. The Master of Applied Economics (MAE) program launched in 2014, as an opportunity to build on Saint Mary’s excellent undergraduate honours Economics program. The Master of Applied Economics offers students the opportunity to research economics and apply the theory to business and society needs. This incorporation of, and focus on, policy issues distinguishes the degree from a more traditional, theoretical Master’s program in economics. The degree emphasizes the application of economic theory and econometric analysis to practical issues relevant to a range of fields. These might include public economics; natural resources and environment; monetary systems; business finance; international trade. With the 2014 launch of the Atlantic Research Group on Economics of Immigration, Aging and Diversity, the opportunity for students to take part in relevant, active research expanded. The Atlantic Research Group built on the work of a previous research centre, the Atlantic Metropolis Centre (AMC). Dr. Ather Akbari, who was a principal with AMC, is the chair of the group, which includes researchers from across the region. The activities of the Centre have focused on engaging practitioners and researchers throughout the Atlantic Provinces. In October of 2014, author and demographer David Foot was the keynote speaker at a Demographics of Change event, which attracted more than 120 registrants. Subsequent events have included community education sessions on the new Immigration policy, a four-site conference on the Future of Work and a regular research newsletter that brings its 130+ subscribers fresh data and analysis. Dr. Akbari has presented his work to the Citizenship and Immigration Committee in Ottawa, had a blog published on the International Observatory of Mayors’ site, and been interviewed by news media on immigration topics as recently as June 2018. In April, 2018, the Saint Mary’s University Entrepreneurship Centre formally launched with a campaign focussing on alumni “Disruptors” and an interactive live event featuring student pitches and a business marketplace. With a nearly 30-year history, the Saint Mary’s Business Development Centre (called the Sobey School Business Development Centre for about the last five years) has a deep tradition of helping small and medium sized businesses launch and grow. Having the Centre relaunched as the Entrepreneurship Centre aligns with the Sobey School strategic plan and the university’s renewed priority of fostering innovative, creative and entrepreneurial mindsets.